The Vikings’ first home preseason game against the Jaguars on Saturday will also be the debut of their electronic ticketing system. They are one of six NFL teams who will exclusively accept electronic tickets in 2018, with the rest of the league expected to switch in 2019. Vikings VP of strategic and corporate communications Jeff Anderson said fans should download the team’s free mobile app, or store their mobile tickets on their device through their ticketing account with the team, and spend some time before the game familiarizing themselves with how to access the tickets. The team started accepting mobile tickets in 2014, and Anderson said 35 percent of tickets at Vikings home games were electronic last year. The Vikings have been using electronic-only ticketing for its first training camp at its new practice facility in Eagan. 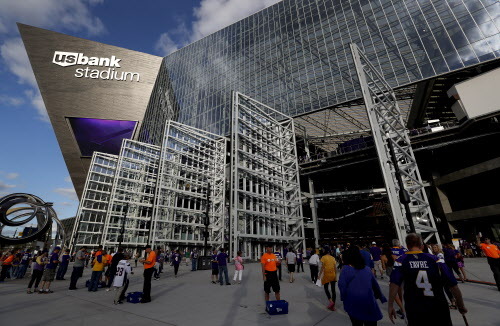 The Vikings made the switch to electronic tickets to streamline the entry experience for fans and create stronger safeguards against counterfeit tickets. Anderson said approximately 50 percent of the team’s game tickets are transferred or sold on the secondary market; whereas paper tickets gave the Vikings no way to know who was actually using the ticket, fans must connect their mobile tickets to an email address, which allows the team to provide updates about weather changes at training camp or traffic issues on game day. The league now offers verified tickets through NFL Ticket Exchange, StubHub and SeatGeek, so fans who purchase a ticket through a secondary market can be assured their tickets are legitimate. While Anderson said the Vikings are aware someone could try to produce counterfeit electronic tickets, he said the team hasn’t seen it happen, adding it would be much more difficult to produce counterfeit digital tickets than falsified paper tickets. Cody Ford, a massive Oklahoma offensive tackle who can also play left guard, could be both the best player available and fill the Vikings' No. 1 need when they make the 18th selection in tonight's draft.